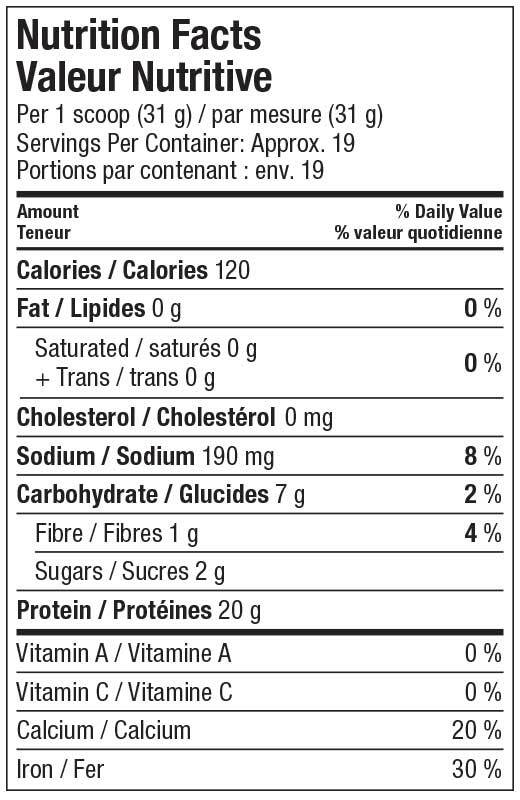 Vega Protein & Greens Tropic is a multisource plant based protein combined with the equivalent of 2 servings of greens. 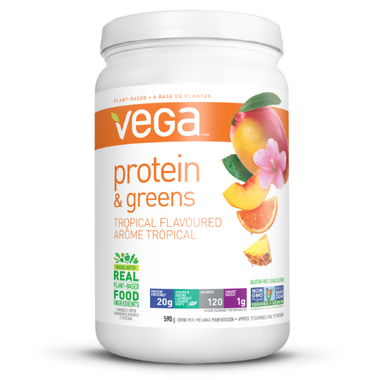 Vega Protein & Greens Tropic offers 20g of complete plant based protein, equivalent to two servings of greens. Nourishing your body shouldn’t be hard work. Vega Protein & Greens covers the basics as a convenient protein boost that makes nutrition on-the-go feel—and taste!—like a piece of cake. Ingredients: Vega Protein Blend(Pea Protein, Saviseed [Sacha Inchi] Protein, Hemp Seed Protein, Sprouted Whole Grain Brown Rice Protein), Natural Mango, Peach, Orange And Pineapple Flavours, Vega Green Blend (Organic Alfalfa Grass Powder, Spinach Powder, Broccoli Powder, Organic Kale Powder), Papaya Concentrate Powder (Contains Naturally Occurring Enzymes), Stevia Leaf Extract, Xanthan Gum, Citric Acid, Malic. Directions: 1 scoop (31 g) mixed with water, juice or non-dairy beverage, shake and go! Or blend into your favorite smoothie recipe. It tastes disgusting and gritty. I tried it with water one time and hot water another time and milk another time. Nothing makes it taste better. Don't like the taste it makes me fart a looooot! Love this product, by far the best tasting! Another great tasting Vega product. I found this one tastes more like peaches than tropical fruit.